Haven't shared to much of my restorations on here, anyone who has me on Facebook will have seen many photos. Felt like sharing today. Progress has been a bit slow as I've had a few other delorean's on the go, but with them out of the way I can really get going on one I'm building for me. 17158 at this point from what we see its one of the last few (of 8 Canadian spec cars. From the digging I've done it was wrecked sometime around 1985, it spent some time in a junkyard down the street from me, was then sold and has had mythical sighting from the local club floating around in back yards sense. One day last summer I just happened to be at the right place at the right time. I was very much into small gm cars (most the jbody) in my younger days and still have a lot of parts kicking around, not to mention cheap and easy to get parts, the ecotec was high on my list (conveniently engineered by lotus I must ad) I wanted a cheap, simple swap, to at least double the hp, good on gas and turn key reliability. Also am not aware of any other 4 baggers so partially wanted to blaze that trail. I'll be running a S20g turbo, capable of around 500hp, have no intentions of pushing that, again want reliable) looking to put down around 300 at the wheels. Lots more detailed photos on my fb if interested, I'll give the quick coles notes of photos on here. Last edited by Gfrank; 04-06-2017 at 08:57 PM. Becoming a tub again. I'm not sure how much was wrecked in the crash, but it was bad, and I'm told the owner thought this was a good way to and I quote " cars heavy in the back, need to save weight"
Can't wait to see this car come to life. You are a master with frame repair and especially fiberglass! Man, I'm torn. I think I would have considered leaving the rear pontoon off and instead adding more steel framing to support the rear quarter panels and rear fascia! Just think of the access you would have had! Tell me it didn't cross your mind! Congrats on getting that long-dead DeLorean on the road to recovery! From the photo of the car on the trailer, based upon the oil pan / lower crankcase it appears that the PRV which was in the car was sourced from a Volvo. Very nice! 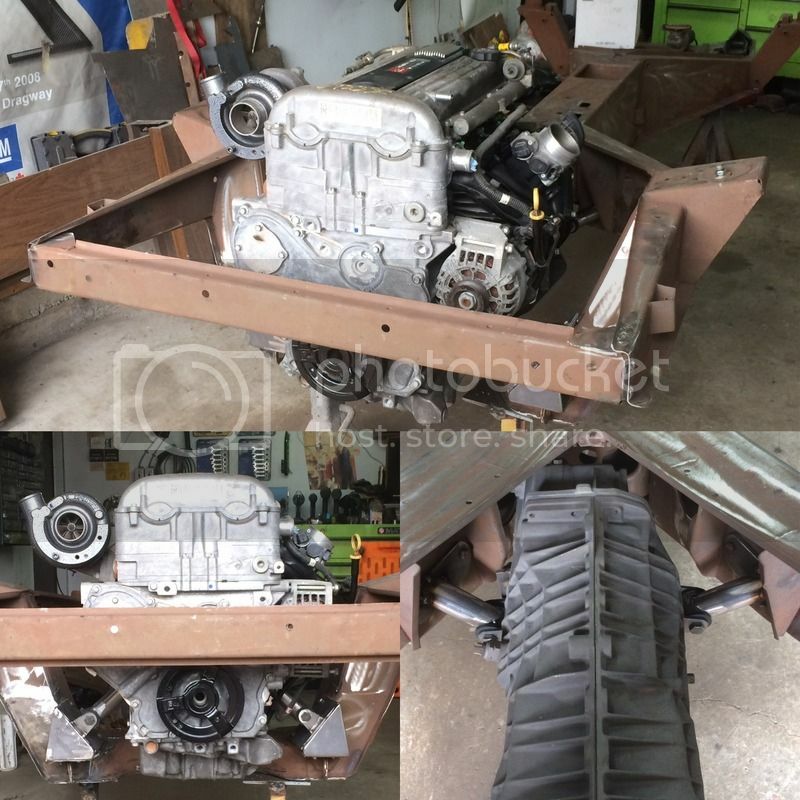 So glad to see one more D owner joining our exclusive "Delorean engine swap" community! Also, extra kudos for applying it to a D that in a lot of people's mind may seem like it was too far beyond salvaging.